Jamaica’s foreign minister Dr Kenneth Baugh, is intimating that the Caribbean integration association, CARICOM could be threatened if an alleged vaginal search of a Jamaican woman mid March by Barbadian border service agents is not dealt with frankly and honestly. 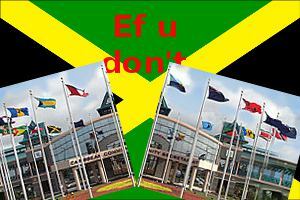 Renting CARICOM over alleged search? “It is not an overstatement to say that the entire CARICOM project could be injured by a refusal to deal with these matters with the frankness and honesty worthy of a Community where mutual trust and respect are essential to the achievement of the objectives of the region,” Baugh sad in statement issued on behalf of his ministry by the state Jamaica Information Service. Myrie said she was detained overnight at the airport in poor conditions and deported next day. The Barbados foreign minister, Maxine McClean after an investigation that Myrie’s allegation was unfounded. Myrie’s story has sparked outrage among many Jamaicans at home and abroad and that has stirred an equally spirited response among several Barbadians siding with their compatriot. Since the imbroglio broke, reports have surfaced from other CARICOM nationals who have had unpleasant experiences with Barbadian border agents. Jamaicans in particular have faced increasing difficulties at border posts in the Caribbean and abroad. Britain imposed visa requirements on the former colonists, as has Commonwealth partners Canada and the former Jamaican protectorate of the Cayman Islands. At US ports, Jamaicans are routinely separated from other arriving passengers as border agents spring into heightened alert on the assumption that potential drug smugglers could be among them. Between the 1990s and mid 20-oughts, British border agents accosted hundred of Jamaican women hired as drug mules to transport cocaine in their stomach and body cavities, and they became the single largest group of foreigners in British prisons. As the Jamaican economy followed its downward trajectory, Colombian drug lords and their powerful politically connected Jamaican agents exploited the women’s poverty and other hardships, and in some instances held their family hostage or murdered them if the illicit missions did not go as planned. The result is that innocent and law abiding Jamaicans have been tarnished by these activities and come under feelings of persecution at overseas borders and slowed down by exhaustive searches at their own departure terminals. Two Jamaican women won substantial damages in local courts after similar searches to the alleged Myrie incident conducted illegally by local police without the involvement off medical or health personnel. “On March 23, 2011, Ms. Shanique Myrie lodged a formal complaint with the Ministry of Foreign Affairs and Foreign Trade, in which she reported abusive and degrading treatment meted out to her at the hands of Border Services Officers at the Grantley Adams International Airport, on 14 March, 2011. My statement to Parliament on 29 March, 2011, conveyed the outrage which all Jamaicans felt about the alleged abuse and the firm intention of the Government of Jamaica that a comprehensive investigation be undertaken. “To this end, a Jamaican Delegation comprised of High Commissioner Sharon Saunders (based in Port of Spain); the CEO of the Passport, Citizenship and Immigration Agency; Crown Counsel in the Attorney General’s Chambers (with expertise in human rights law) and the Deputy Superintendent of Police in the Organized Crimes Unit of the Jamaica Constabulary Force (JCF), was dispatched to Barbados on 30 March to carry out preliminary investigations. On arrival, High Commissioner Saunders, who headed Jamaica’s delegation, met with a Barbadian delegation, led by Senator the Honourable Maxine McClean, Minister of Foreign Affairs and Foreign Trade, including a Minister of State and a Parliamentary Secretary, both from the Office of the Prime Minister. “At that meeting, the Barbadian delegation re-affirmed the information contained in the Press Release issued by the Barbados Government Information Service (BGIS) on March 26, that Miss Myrie’s allegations were unfounded. The High Commissioner was advised that the Barbadian Prime Minister had met all officers who were involved in the case and he was satisfied that the matter was addressed thoroughly and conclusively. “High Commissioner Saunders referred to a statement made to the Barbadian media by the Parliamentary Secretary in the Office of the Prime Minister, with responsibility for Immigration, linking Ms. Myrie to human trafficking occurring between Jamaica and Barbados. He had claimed that the Authorities were aware of this trafficking. The Barbadian Foreign Minister did not agree that the statement was meant to imply human trafficking in the internationally-accepted definition of the term. Notwithstanding, this erroneous statement to the media must be withdrawn. “The Barbadian delegation stressed that there was no discrimination or prejudice against Jamaicans, but the laws of the land would always be observed. They emphasised that anecdotal reports do not constitute evidence of abuse, discrimination or prejudice. “However, subsequent meetings between the full Jamaican delegation and high officials of the Barbadian delegation, a tour of the detention facilities at the Grantley Adams International Airport and a well-attended meeting with the Jamaican community in Barbados, led the delegation to the unanimous conclusion that there are widespread perceptions of negative attitudes towards Jamaicans and that Miss Myrie’s report was deserving of the fullest investigation. “The delegation made a full report to the Honourable Prime Minister Bruce Golding and myself on 4 April, 2011. We accept its conclusion. Furthermore, the Government of Jamaica considers the Press Release of the BGIS, issued on 26 March, to be an unacceptable response to the formal communication from Jamaica. The Government of Jamaica will be vigorously pursuing this matter. Indeed, details of the delegation’s report were shared with Miss Myrie’s Attorneys-at-Law, to assist them in determining how best to proceed on her behalf, as the alleged degrading cavity search was illegal. “Clearly, due process can only be served when Miss Myrie is afforded the opportunity to identify the persons who interrogated her. “The Minister of Foreign Affairs of Barbados has already indicated that she would welcome a visit from Miss Myrie to Barbados, for the purpose of pursuing further investigations. “Consultations are ongoing on the course of action which should be pursued. Above all, it must be clearly understood that the Government of Jamaica takes very seriously its responsibility to protect and defend the rights of its citizens. Miss Myrie’s case will be pursued on its own merit and so will other cases which have been reported to my Ministry.